Description: Looking up Broadway from the Times Building, New York. Yesterday upon the stair I saw a man who wasn’t there. I saw him again there today. I wish he’d go away. –Is the writer being stalked in the dimly lit stairwells of the 1930’s and reaching out for help or . . . Is it actually a little known poem turned into a Glenn Miller swing song. We will never know, but hopefully it was the latter. – The words come from “Antigonish”, an 1899 poem by American educator and poet Hughes Mearns. It is also known as “The Little Man Who Wasn’t There“, and was a hit song under that title. – But it wasn’t until July 12, 1939 that a recording of the song by the Glenn Miller Orchestra with vocals by Tex Beneke became an 11-week hit on Your Hit Parade reaching #7. – So, is ‘WHD’ part of the Glenn Miller band trying out lyrics in as early as 1937? Or is ‘WHD’ just a very learned poetry aficionado? – Mr. G.O. Moon’s State Office Building in Columbus, Ohio was demolished in 1970 for the sake of better views of a taller office tower. – ‘WHD’ ironically went on to be the call letters of America’s first ‘top 40’ radio station in Kansas City, Missouri. An innovative and well-financed entrepreneur, Todd Storz, came from Omaha to purchase ‘WHD’ and came up with the pioneering concept of playing only ‘top 40’ music hits, therefore changing American radio forever to this day. – The song itself was used in many movies (especially spooky ones) and has been recorded by many other artists (even heavy metal bands) up to this day as well. 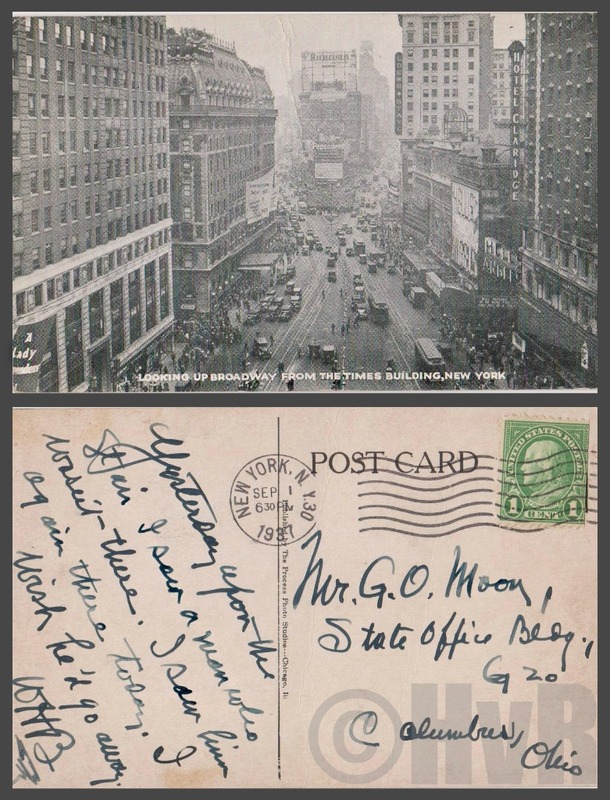 – The postcard itself is a 1930 view of Broadway. Your clues: two signs advertising two hit movies of the year 1930. “A Woman Surrenders” starring Basil Rathbone and Conrad Nagel. And the hugely successful Howard Hughes film “Hell’s Angels” starring blonde bombshell Jean Harlow. It was one of the first ‘talkie’ films. So, postcard hunting turns out to be a pretty fun mystery, insightful and learning experience!